So Siam area was done. Time to move to Bangkok's historic center, Rattanakosin Island. We also want to check out the night scene at the very busy and "touristy" Khao San Road (KSR). 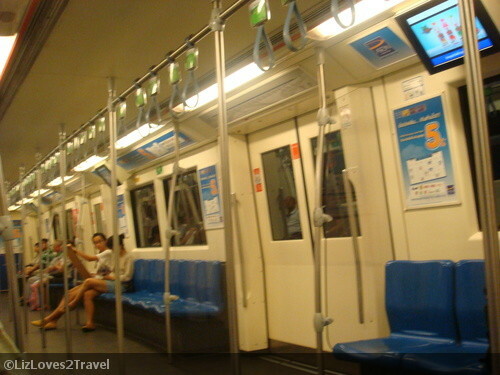 From BTS Chitlom (Yellow Line), we went off at Asok Station for the Blue Line interchange in Sukhumvit. 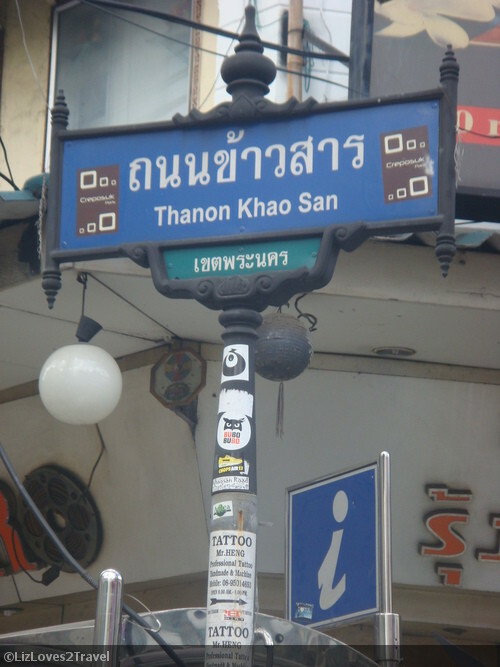 Then from there, we got off to Hua Lamphong station and took a bus going to the Khao San area. That was an unforgettable bus ride! The bus conductor was a sulky lady boy. We initially thought she was a female because she really looked like one. Oh well, we were in Thailand hehe. We just figured it out later on. So we sat together in one double seat and the bus got full almost immediately. Then there was a monk who rode and there was no more vacant seat for him. It was just our second day in Thailand, so we were completely unaware of their customs. It was also our first public bus ride there. The conductor suddenly shouted and pointed at us saying "you! you stand up!". Terrified of his scary tone, we obliged right away. It was insane. We never knew if just because we were foreigners, we should give up our seats to the monk. I just didn't get it. Being Thai's, shouldn't they be more courteous enough to give their seats? They were the ones who knew what should be done if you see a monk, right? Well, whatever. We just followed. After he was seated, the monk motioned for my partner to seat beside him. My beau, being polite was refusing to do so and wants to leave the seat to the monk all by himself. Then the lady boy shouted again "you sit!". So he sat. We were like, okay fine but I was cringing. I read somewhere that they can't be touched by a woman, so I understood why he was chosen instead of me. Good thing, many passengers got off on the next stop so I also got seated afterwards. I actually disliked how the conductor treated us. I don't like being shouted at in general (regardless where I am or who's doing the shouting). I just kept my temper in check because we were in another country but deep inside me I was swearing. So I noted, courtesy is not much of a virtue in Thailand. Aside from that uncanny experience, we were also caught in a traffic because some areas we had to pass through were flooded. Yeah, there was no train connection going to Khao San so you really need to travel by bus or taxi. The boat operation in Chao Phraya River was also on halt because of the flooding. After almost two hours, we were dropped off in Phra Arthit Road which was quite a walk to KSR. No public transport passes through near that area, only taxis. We successfully navigated the streets just by following the map that I printed. We immediately looked for our guesthouse because walking with our heavy backpack was so tiring. It was a little hard to find as it is tucked in a small alley somewhere in the middle of Khao San. We stayed in New Joe Guesthouse because it was one of those cheapest inn that we could get (THB 350 per night). As expected with the low rate, it was a little dingy and it has those doorknobs that you won't feel safe leaving something valuable inside the room (if you know what I mean). Unfortunately, I was unable to take photos of our room. 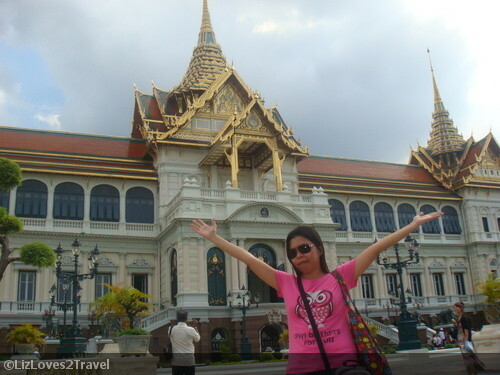 When we were all set at the guesthouse, off we went to tour The Grand Palace. It was just a short bus ride from KSR. We were there in 10 minutes. We can actually just walk but we're pressed for time. We paid the THB 350 entrance fee and beau changed into a long pants before we explore the palace grounds. We started from the Outer Court entrance. The other gates were closed because they were flooded. What can I say? The entire structure is very grandiose. Well, it used to be the residence of the Kings of Siam (Thailand's former name) that's why. It was hard to take photos with no other people in the background hehe. Never thought BKK would still be crowded with tourists despite the flood warnings in the travel advisories. The royal family no longer lives in the palace at the present, but they still use it for royal ceremonies. They also said some royal offices are still operating here up to now. The throne hall is the largest among the building structures if I remember it right. It is said to be where they entertain very important foreign visitors in their country. We took a lot of photos inside the palace. Everywhere you look is incredibly photo-worthy. I can't imagine how did they manage to do such magnificent architecture and flamboyant structure. When we got out the palace, there are street food vendors outside the gates so we sampled a few of those. It was actually pricey. Maybe because they're located in a tourist spot where unsuspecting foreigners will buy just anything when they're hungry. 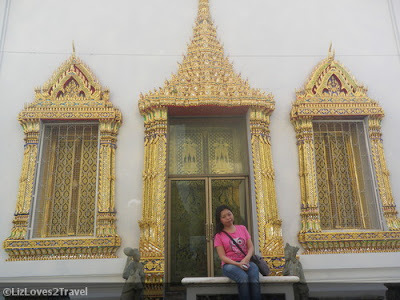 We moved on to Wat Pho after having some street snack. 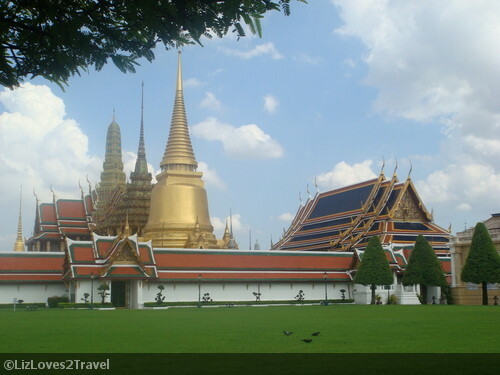 Adjacent to the Grand Palace is Wat Pho or the Temple of the Reclining Buddha. It houses a massive golden buddha which is lying in the side, hence the name. This is also the place where the traditional Thai massage started as they say. 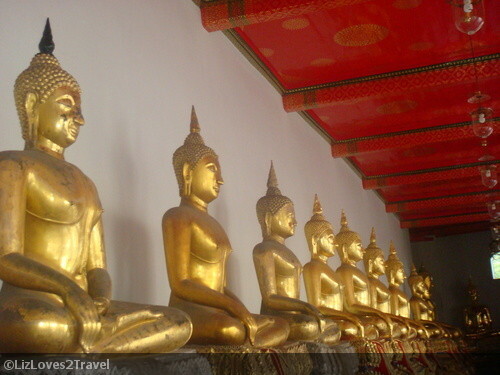 It also houses numerous Buddha statues like these. According to my research, this one is an Enlightenment Buddha which signifies insight, purity of character and self mastery. 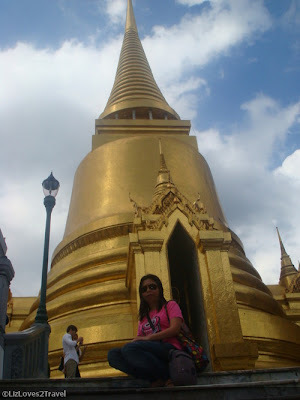 I also enjoyed checking out Wat Pho. It was equally delightful. 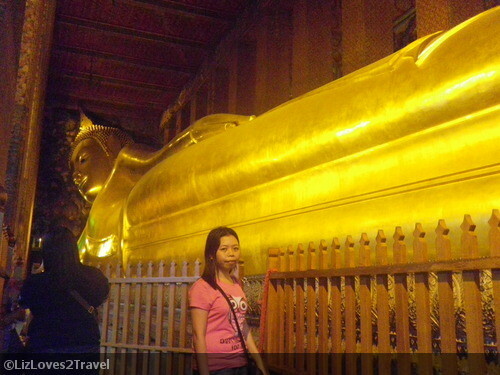 The reclining Buddha was the largest Buddha I've ever seen. 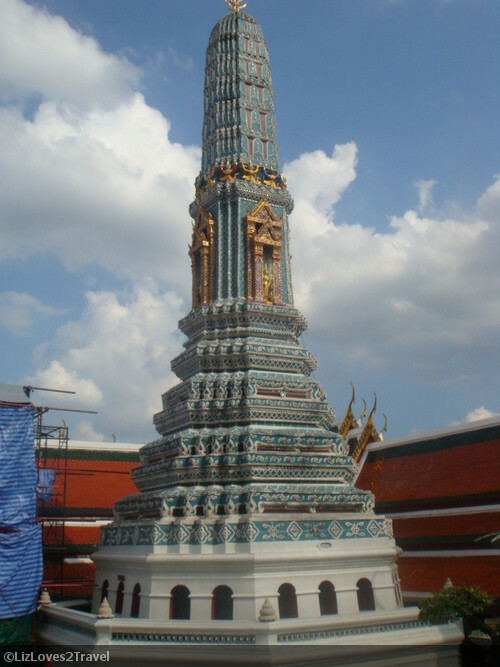 Our next stop should be Wat Arun or the Temple of Dawn. 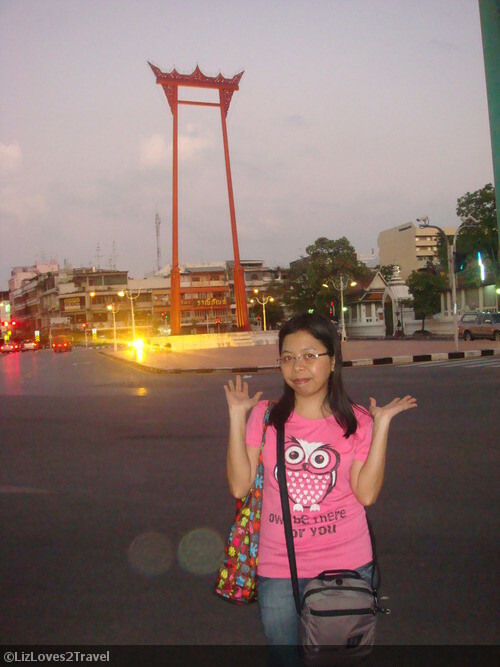 It is in Thonburi which was on the other side of the river. 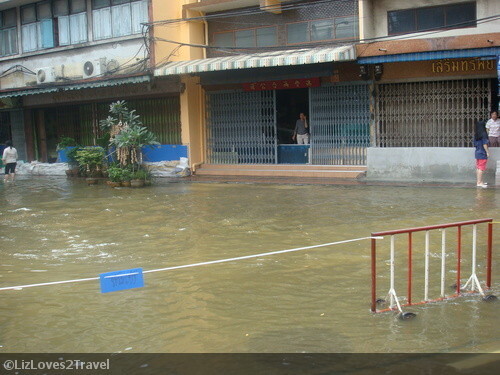 The only way to reach it from the Bangkok side is through a ferry which was not working that time because of the flood. :( Check out the photo below, Chao Phraya almost overflowed if the raining did not stop. The jetty railings were almost if not completely submerged. We just looked at it from the riverside. Aww... another place we hadn't explored because of the flood. 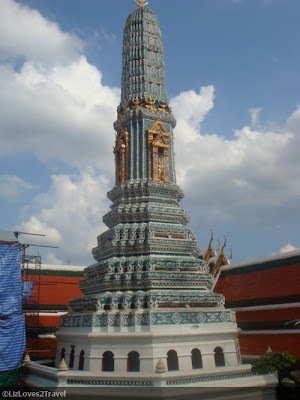 They say this one is different from the rest of the temples there because you can actually climb up and see a fantastic view of Bangkok from the top. Maybe next time. 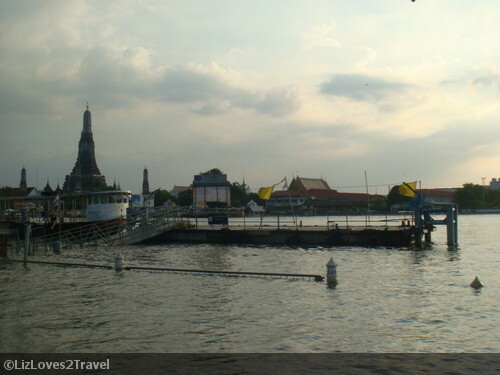 We continued our tour after passing by the river and catching a glimpse of the Wat Arun. The sun was already setting so we have to make the most of our time to see some more attractions. We were leaving for Cambodia the next day. We passed by a couple more Wats but they were flooded. We went on until we reached the Democracy Monument. 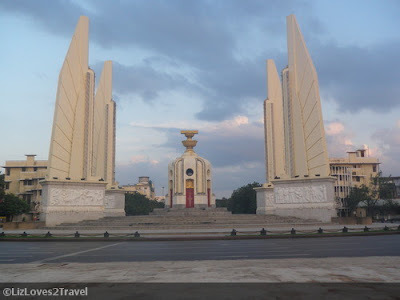 It is a commemoration of the Siamese Revolution in 1932. This is actually located in the middle of a highway. So be careful when crossing to get there haha. The vehicles can be very fast. 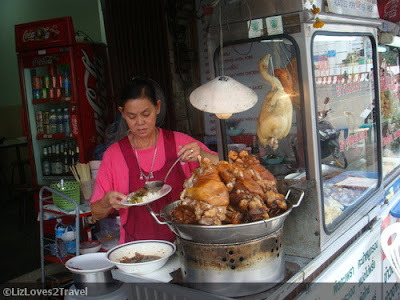 We passed by some street food vendors again and sampled their local delicacies. Another yummy experience. Then we walked again until we found that giant red swing. The Giant Swing is located just in front of another temple Wat Suthat. Since it's already late, we could no longer explore the temple so we just took photos with the swing. Can you imagine getting a bag of coins from there? They said there was a ceremony like that being done in the past. I imagine doing it like reverse bungee than climbing it up like palo sebo. Haha! It got darker every minute so we decided to walk back "home". We freshened up and got ready for a night-out in the wild Khao San Road. It was our last day in Thailand anyway. The whole flooding situation has affected our original itinerary. Aside from those flooded temples in Bangkok, we were unable to shop in Chatuchak Market and temple-hop in Ayutthaya. Both were heavily flooded and closed to tourists. We decided to just spend another day in Cambodia. This is Part 2 of my Bangkok travel series.